This may not come as an Earth-shattering surprise but Bethesda says there will be no demo for The Elder Scrolls V: Skyrim, the next chapter in its epic open-world RPG series. A good demo is a tricky thing. You need to whet the appetite but leave them wanting more; it has to represent the entirety of the game without giving away the store. Above all else, it must not underwhelm. That's a tough formula at the best of times and when it comes to huge, open-world games like those of the Elder Scrolls series, it's just about impossible. So Bethesda isn't even going to try. "We won't be doing a demo," Producer Craig Lafferty told Gameplanet. "A game of this size and complexity, it's really hard to do a demo that represents the game. It'd be a gigantic demo as well, so we won't be doing a demo." It's been awhile since the last Elder Scrolls demo: 15 years, in fact, when Bethesda released a single-dungeon teaser for the great Daggerfall. It showed off the game's dungeoneering capabilities reasonably well but gave no hint about the depth, complexity or sheer size of the real deal. In other words, it was more or less a waste of time and effort that could have been better spent on the game itself. So, no demo? No problem. 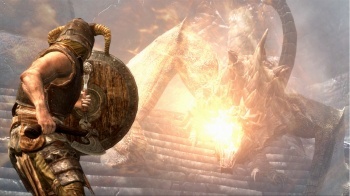 The Elder Scrolls V: Skyrim comes out on November 11, 2011, for the PC, Xbox 360 and PlayStation 3.